160m FT8 - The End Of An Era? If you follow any of the numerous ham radio-related discussion groups then you know that every once in awhile a thread pops up that triggers some extended and often heated chat. One such thread on the Topband reflector, is now finally starting to gasp its final breath but not before running through several dozens of well-thought replies and opinions. I can easily imagine a similar thread, had the Internet been around, when SSB quickly began taking over the phone bands! The thread began when veteran 160m DXer Steve, (VK6VZ) posted an observation that also hit home with me ... the seemingly overnight disappearance of a huge percentage of CW / SSB activity on the HF bands. Steve's comments are directed towards 160m, where weak signal work has always been an enjoyable but challenging activity but I have noticed the same effect on my other favorite band, 50MHz. With the sudden popularity of the new FT8 weak-signal fast-mode, the bands have changed. As I and others have often stated about Topband DXing, 6m weak-signal DX as well as EME, "if it were easy, it wouldn't be fun" ... perhaps that is what has now happened. Both Steve and myself see many of the things we have cherished and enjoyed about ham radio for so many years now harder to find and wonder ... is it the end of an era or not? sounds that radio signals make - and even miss the comforting sound of Loran that I grew up with around 1930kHz as a teenager in south-east England. Yeah, I am one sick puppy. With the emergence of high resolution bandscopes through SDR technology over the last decade, I embraced that as it meant that I could find what DX stations I wanted to hear and contact quicker and more easily (and, in particular, before those stations who didn’t have the same technology). able to see what I could hear (and no dinosaur me, I was an SDR fan boy!). radio modes, in particular by Joe Taylor K1JT. As a topbander I could see that these modes in which you ‘saw’ signals through the medium of computer screen or window as being a remarkable technical achievement, but had relatively little to do what I and the vast majority of active radio amateurs practiced as radio on 160m, as it had nothing to do with the audible. The good thing was that I could see that good old CW and Silly Slop Bucket (you can see where my prejudices lie) that I like to use were still the modes of choice for weak signal DX topband radio contact as these fancy digital modes were either very slow or, if they weren’t, were not good at dealing with signals that faded up and down or were covered in varying amounts of noise. first and all-time love topband, for other than experimentation. Then, out of the blue, along comes FT-8. Joe and Steve Franke K9AN have quietly created the holy grail of digital operation with a mode that can have QSOs almost as fast as CW and SSB and over the last eight weeks 160m DXing has changed, perhaps for ever. Where once there were a few weak CW and SSB signals (I am in VK6, which is a looong way from anywhere with a population so we only ever hear a few), I can see that the busiest part of the band is 1840 kHz – FT-8 central. On some nights I can see FT-8 signals on the band but no CW or SSB. There are countries I’ve dreamed for 20 years of hearing on 160m SSB/CW (for example, KG4) regularly appearing on DX clusters and I can see the heap of FT-8 activity on my band scope. Frustration sets in and I even downloaded the FT-8 software but, when it comes down to it, I just can’t use it. My heart isn’t in it. voice (even the way some my SSB mates overdrive their transceivers is actually creating nostalgia in me). The human in radio has somehow been lost. Now, over to you other topbanders, especially those who have dabbled with FT-8 and live in more populous areas. Has the world really turned upside down and what do you think the future holds? I think the game changing aspect of FT8 is that many folks who would normally be available to work on CW or SSB will now be on FT8. The amount of activity on the FT8 frequency of any band is phenomenal. ... he was sending (me) a text message that he was sending me RRR and I needed to be sending him 73! Who needs a radio? I turned off the radio and uninstalled WSJT-X. Pure and simple —- No skill, no thrill. I hear a lot of moaning that there is not any cw ....... well quit moaning and call CQ for a while ... do it often, not just listen . Stu W1BB had the attitude of do whatever you have to to make the DX contacts. There is no doubt in my mind that he would be using JT9, FT8, spark or whatever it took to make new country contacts. FT8 is already falling victim of its own success. In my case, the number of incomplete QSOs is increasing, due to QRM caused by 'over population' in the FT8 segment. There was a time when SSB was considered evil. If using a digital mode keeps someone involved in ham radio or generates new interest, then I'm all for it. On the other hand, these new modes enable a whole new layer of operators. A new target rich environment for more opportunities to work new DX. The RF still has to go from A to B to be decoded. A similar situation regarding digital modes took place on 50 MHz this summer. In the case of 6 meters, JT65 and FT8 are now the predominant modes for DX work on 6 meters. During terrestrial sporadic-E openings, there are very few DX stations now operating CW or SSB on 6. Meteor scatter is the realm of MSK144. If you want to work DX on 6 meters now - digital is where it is at. Like FT8 or dislike it, it's really not the end of Ham Radio. Technology is constantly changing. Get on the air. Do your thing. Have fun. When it ceases to be fun for me, then I know I'll move onto something else. I've been licensed for over 60 years, and have been a thankful participant in ham radio's golden years, but if continuing on means having to make qso's that I don't hear and that I can't understand without a computer, then it's of no further interest. I almost bought the new transceiver I've been wanting this year .... until I saw the reflector post about the gentleman who "worked 20 new ones this season, and I couldn't hear any of them!" The new purchase is now on hold, until I see how this plays out. If there is a rapid change to digital only DXing on 160, I'm going to be happy I saved my money for one of my more interesting hobbies. The problem is not the type of mode but the Internet. We're spending too much time ragchewing on these groups instead of tickling the ether. However, the trouble with the computer-based Digital modes is that there is no SKILL involved in having a contact - it's your Computer having a contact! You still need to set up a radio, antenna, and, of course, the computer and software to do the digital modes. Making QSOs after all of that is not a given. Different skills than CW or SSB I'll grant you but skills none the less. Put me in the group who of those who arrived kicking, screaming and being drug from Tubes to Solid state. From AM to SSB. From Analog to Digital. It is called advancements in technology. I still dislike cellphones. But I use them. And also all other forms of Ham Radio. You guys should have been around for the AM versus SSB discussions/wars without the use of the instant communication internet. VERY SORRY, BUT if 50 mc and also 1.8 mc is going to be the same this and coming 2018 season, I stop my ham-radio and will do something else. I give it to end of 2018 to see if any changes will come. Well said. . .I totally agree. I’m sure there will be people who say FT8 is just “progress.” But some psychologists divide people according to whether their preferred mode of experience is auditory, visual or kinesthetic (touch). I think most of us who are addicted to radio are primarily auditory – on one level, that’s why we’re in this hobby. So, no surprise that we find radio without the auditory component to be unfulfilling. ... let's all maintain our ham licenses and continue using our favorites modes. ... don't give up. There is still plenty of magic in ham radio. I'm not knocking the guys using the digital modes. It's obviously a new and interesting technology and they are having fun, which is the reason we do this, right? I just have ZERO interest in it all and still get my fun actually hearing and working another station. When it comes to actually making a QSOs, I really don't know what you get out of the process where two computers communicate with each other using signals that are not audible. The new digital mode is an evolution of doing nothing. Skype would be more fun ... digital mode is boring and soon the FT8 user will feel that way too. Call CQ 5 times and then turn your computer on, every day, if all of us do it once a day, the band will be fun again. JT modes were originally designed for VHF. 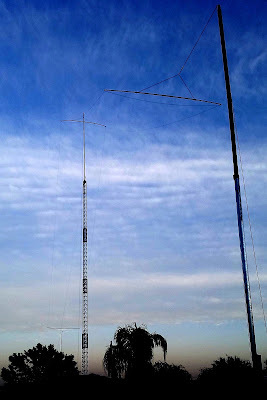 No reason to use them on HF and especially on Top Band. I guess I don’t understand what makes the new Digital modes any different from old RTTY. 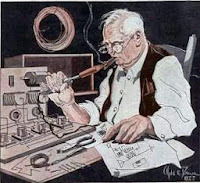 There will always be a place for CW and voice modes in ham radio for those that want to practice those ... and remember one of the major facets of ham radio is to “advance the state of the radio art” which surely describes the new digital modes. People should be excited that there are now so many signals on 160! 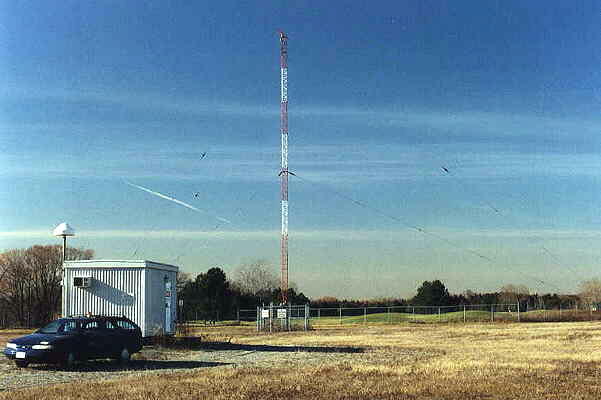 It is allowing people who have smaller stations the opportunity to get on and use their radios and a computer to make contacts they never would have been able to make. This is great for ham radio! Thanks very much to all those who contributed to the thread following my ‘FT8 - the end of 160m old school DXing?’ post. Here is a summary of what appeared in my ‘In Box’. First, special thanks to CJ Johnson WT2P for bravely giving the ‘new school’ perspective and actually taking radio, in FT-8 form, into his workplace . As CJ says, FT-8 is just another natural progression of the hobby, which actually appeals to the ‘20-somethings’ we need to join us (and who just happened to be brought up with lots of screens rather than cardboard loudspeakers and bakelite headphones). Vive la difference! In regard to the emails received via the reflector or privately, there were three things that came through very loud and clear (actually deafening). 1. There are lots of long-time, old-school topbanders (and 6m users) like me who enjoy chasing weak signal DX on CW and SSB and are now worried about the future of this activity because of the current high usage rates of FT-8 on those bands. Always better when you aren’t alone! 2. We can band together and do something about this - the solution for us old school ops who want to keep CW and SSB vital on the two magic bands is to go back to first principles – lots of CQing, tuning the band regularly and answering CQs – rather than just watching our bandscopes and DX clusters. We all know that only activity breeds more activity. Duuh! (I feel really stupid now). We’ve all got CW memory and/or voice keyers – if we don’t want to actually CQ manually, we can use them for lots of daily CQing and make sure we answer anyone who calls us. We also need to answer those who we hear calling CQ to keep the band alive, even if we worked them the day before – as we did in the older, less hurried, more polite days of yore. 3. The ARRL could be encouraged to change the DXCC program and add a new mode-specific category for the evolving ‘new wave’ (i.e. WSJT) family of digital modes, where contacts can be made with stations that are basically inaudible (i.e. as Hans SM6CVX suggested, where the signal levels are –1dB or more below the noise). To keep the peace with existing DXCC holders, one potential solution is those traditional modes which generally need audibility – typically CW, SSB, RTTY and PSK-31 – would count for the long-standing Mixed mode, but the inaudible ‘new wave’ digi modes would not. However, the growing and evolving family of inaudible ‘new wave’ digital modes could have a whole, bright, shiny new DXCC category to themselves, for which all the current WSJT modes and their evolving, successor modes would count. Another different but related idea came from Mark K3MSB - why not ask the ARRL to consider awarding band-specific DXCC awards with mode endorsements (i.e. 160M DXCC-CW, 160M DXCC-FT8, 40M-Digital, 17M-SSB etc). If we want to get this kind of change to the ARRL’s DXCC program, then as Mark suggests we need to make our voices heard. This could be simply done by creating an electronic petition to the ARRL signed by as many current members of the DXCC program as possible, clearly spelling out what sort of change the petitioners think is needed. There is a great website which can be used for this purpose - see https://www.change.org/start-a-petition – and it should be easy to publicise a petition of this kind, using reflectors. For many years I was involved in administrating amateur soccer and have experience of using electronic petitions as a means of showing an administrative body the level of support for specific changes to the way the game is run. In my experience, electronic petitions are a viable way to get rules changed these days. Some people hate them, but BIG petitions actually do get results. Hope the above summary of ideas was of interest. Please excuse me now and I’ll get along to the low end of 160m, start doing something practical like CQing and stop worrying about the demise of old school radio (which I’ve probably greatly exaggerated). All-in-all, some food for thought! Personally I exploit the weak-signal properties of the WSJT JT9 mode on 630m, but only when conditions are too poor for CW. I dearly miss the drop-off of CW DX activity on Topband and on the magicband. For now anyway, I will continue to avoid the use of FT8 on the HF and 6m bands, keep flogging CW, and hope that things are not as dire as some have suggested. Times are indeed interesting and changing ... and as always, eventually time will tell. It's hard to believe but this coming weekend will see another monthly CLE challenge. This time the hunting grounds will be: 385.0 - 399.9 kHz. A nice challenge in this one is to hear the Oshawa (Ontario) NDB, 'OO', on 391 kHz. 'OO' is an amazing 7-watter that has been heard on both coasts as well as in Europe! Look for 'OO's CW identifier, repeated every 10.2 seconds, on 391.400 kHz with your receiver in the CW mode. 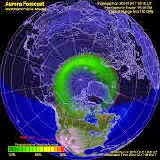 Usually the Fall season provides some excellent propagation as the summer thunderstorms quiet down but the recent warning of upcoming geomagnetic activity for the weekend may mean something else in store for us. Often these 'warnings' are not as dire as they might appear and MF propagation remains robust or even enhanced. If you are interested in building a system for the new (U.S.) 630m band, the CLE will give you the chance to test out your MF receiving capabilities. Our 224th Coordinated Listening Event is less than a week away. has passed and we can all hope for some good reception conditions. (not in an attachment) with 'CLE224' at the start of its title. # The date (e.g. 2017-10-29, etc., or just 29) and UTC. Have fun and good hunting! 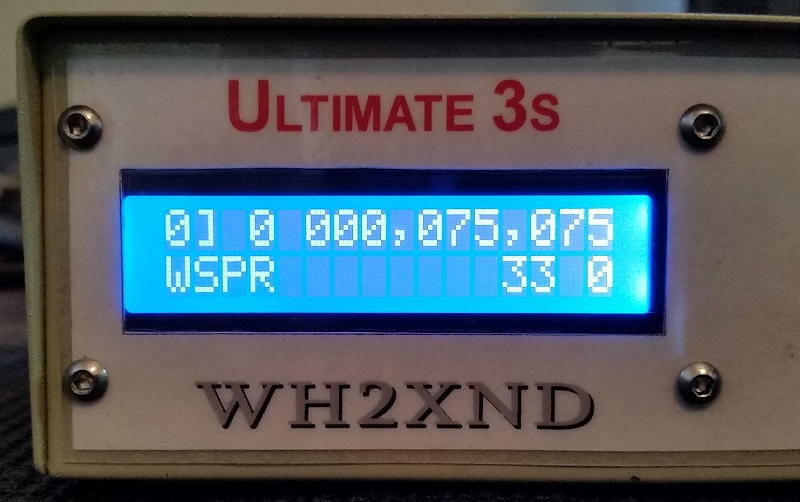 For those of you with an interest in amateur LF work, you may be interested in the upcoming WSPR test transmissions from Ron, WH2XND / NI7J, located in Phoenix, Arizona. One of Ron's several experimental licences allows him to run as much as 10W ERP from 68-76 KHz. To generate this amount of ERP at 75 KHz requires a lot of power and I suspect that he will still be well under his licence limitations ... amateur-sized antennas are just not very efficient on these low fequencies. Previous experiments a few years ago, at lower ERP, produced impressive results, as shown by one of the WSPRnet maps for an overnight session on 75.075 KHz. 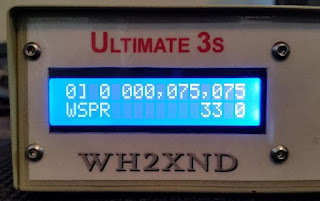 Ron used one of the Hans Summers U3S transmitters to generate his LF WSPR signal, amplifying it with a 400W Hafler audio amplifier. This winter's tests will be at 800W, with a W1VD FET amplifier designed for VLF. Ron's experimental licence also covers 470 - 495 KHz at a whopping 100W ERP and 130 - 140 KHz at 50W ERP ... some serious power. 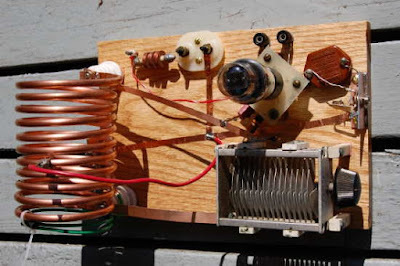 You may also find Ron's interesting and well-illustrated website description of some experimental antenna work that he has been doing on MF, LF and what it takes to resonate a typical Marconi 'T' on these bands. 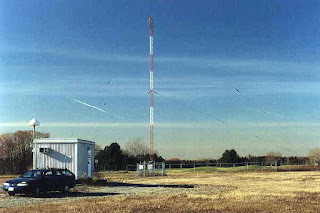 Ron has tentatively chosen late November or early December for his 'almost' VLF tests and when the date and frequency are finalized, I will post the information here on the blog. Online SDRs (Software Defined Radio) continue to grow in numbers and popularity. Listening on a receiver that is running in another state, province or country can fulfill a number of functions for you, depending on your particular interest. The network that I have explored several times and one that works nicely with most web browsers (no software to download or 'extras' required) is the SDR.HU network of Kiwi SDRs ... just choose your receiver and away you go in a matter of seconds. It's all very slick and if you have never played with an SDR before, it affords a nice introduction to this amazing technology. Although it won't work with my ancient version of Internet Explorer running on Vista, it did fine with Firefox and even worked very well on my old I-Pad! Here is a 30-second YouTube video to give you an idea of what it looks like. There are a huge number of choices from all over the world available on the Kiwi network. As I write this, there are presently 199 receivers online! Any particular receiver can support a maximum of four users at a time so if the one you want is full, simply check back later or go to your second choice. Although all receivers have the same appearance online, not all will offer the same performance. Although most seem to cover 0-30MHz, I see at least one that is limited to the VHF range and several that don't go all the way to the bottom of the VLF band. The antennas used seem to favor wideband loops, both large wire styles and smaller active versions as well as active e-probes. The best way to determine any particular receiver's operating performance is to try it out using test target signals that might indicate good performance from that location. If you're interested in BCB capability, test some of the European ones to see if they can hear any TA signals around sunrise in Europe. Many SWLs will use these receivers to compare what they are hearing at home with a receiver located closer to the suspected DX target signal. I myself found the network particularly handy for listening to my Tri-Tet-Ten transmitter on 10m CW a couple of years ago when the muf was much higher than it is nowadays. I'll be trying a few of them out this winter, listening for my 630m CW signal, at various locations. Some of the receivers appear to offer good, low noise reception on LF, MF and the BCB but the vast majority are not DX machines oriented for this part of the spectrum ... this was the opinion of one notable BCB DXer who checked many of those in eastern NA as well as western EU. The jury is still out on the westerern NA receivers and those in the Pacific / Far East ... a worthwhile listening project when there is some spare time. Even though the receivers used on these lower frequencies did not usually offer stellar performance, they may be real workhorses within the ham bands or on the international shortwave bands. It would be worthwhile to see some form of 'performance rating' or feedback page for each individual receiver. Although there is a 'vote' tally associated with each receiver it's not clear what this actually represents as receivers that have been online for longer periods would naturally have a higher tally. A lot of additional information about the KiwiSDR network can be found here. No doubt you can think of your own good reason to have a remote listen to some of the network's growing list of online receivers and put them to the test ... there may be some real treasures to be found. 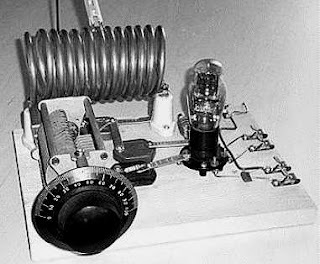 A recent posting to the Yahoo AWAGroup, reminded me of a wonderfully simple transmitter that would easily get anyone on-the-air for the Bruce Kelley '29 QSO Party coming up in December. The AWAGroup is largely composed of '29 builders and operators and is often the source of much good discussion related to these activities. 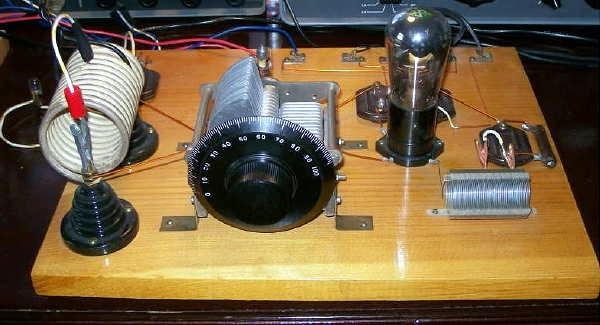 When builders first tackle a '29 style rig, eligible for the BK Party, the first thought is often about finding an affordable tube that might make the transmitter a 'legal' entry. A suggestion of tubes and their relative availability can be found here in one of my earlier blogs. Although some of the tubes may not be typical junk-box items, one that is often very readily available and inexpensive is the '27' or the '227' / UX-227. The '27 was a popular audio tube used in receivers back in the 20's and can easily be pressed into service as a self-excited oscillator on HF. When properly adjusted, the '27 can produce up to 4W of RF, more than enough for you to join the '29 fun a make plenty of contacts over the dual-weekend event. Scott, WA9WFA, has produced a great article describing the construction of a 1929 Hartley oscillator using the 27. There is no need to utilize period-appropriate parts, other than the vacuum tube itself. If you are pressed for building time or just want to get something on the air, there's no need to be overly concerned about construction aesthetics ... there's plenty of time for that later, and besides, the uglier ones often work and sound the best! Power supply requirements for the transmitter are pretty minimal and could even be an old receiver supply ... something that delivers 250-300 VDC at 35ma. An effective way to easily double the power of this transmitter is to add a second tube in parallel with the original one, providing your power supply can supply the extra current (~35ma) required. Although Scott's information describes an 80m Hartley, there is no reason why you could not wind a coil for 40 or for 160 and take advantage of any activity on those bands as well. Like most of these link-coupled outputs, you'll probably squeeze a little better efficiency from the circuit by adding a variable capacitor (~365pf) in series with the pick-up link and the hot-side of the coaxial feedline. Nick, WA5BDU, wrote his description of building the 27 Hartley which can be found here. He also includes information on running the 2.5V filament from a 5V transformer. 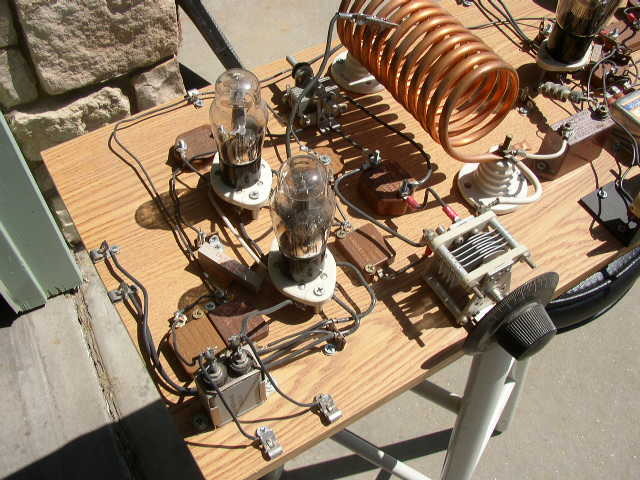 ABØCW uses two 27s in parallel for the oscillator section of his 1929 MOPA. Details of his interesting Hartley can be found here. As further proof that you don't need a lot of power to have fun in the 1929 BK Party, here is the rig that Kevin, WB2QMY, used when we worked on 80m CW. His little TNT, just barely putting out 2W, made it all the way from New York! When it comes to the BK ... if you build it, they will come. Hopefully you can join the fun this winter as well.